Having a website is one thing; bringing in visitors is something else, and definitely worth thinking of. What do I do with a site with no visitors? What use is a website visited only by friends and relatives I mention it to, or clients who already know me? Let's take first things first. Having a website is like getting a shop window visible from any part of the world. The problem with this shop window is that it's set up in the middle of the Sahara desert! No one will type your website's address to get there (unless you are among the very few who have registered a simple-to-think-of domain). Most visits to websites originate from search engines, as well as site-to-site references. If we want to have visitors to our website, it has to appear in search engines, and anywhere else our would-be customer will look in. Suppose we have a hotel in Mykonos. Our would-be customers are European and Greek tourists who want to book a room, so they open up Google (as the most popular search engine), and keyboard: mykonos hotels. Google will show them a list with... 3,400,000 results! As one would imagine, our candidate customers will not go through all of them, but will only scan the first 5-20 results (1st και 2nd result pages). According to the statistics, if they do not find what they're looking for within those 20 results, they'll try with different keywords. So if we want visitors, we have to "push" our website up to the top 20, or better still, up to the top ten results for our key phrase (in our case, Mykonos hotels). This is "website promotion". Read the criteria according to which Google categorizes websites. So, how can we have "the right visitors" for our site? That is, visitors looking out for our product or service, who are most likely going to buy? Basically, there are two ways of website promotion, selected according to the item promoted, and the existing competition. One is Search Engine Optimization (SEO) and the other is paid advertising through an advertising campaign. Google SEO results are shown to the left, while to the right, are the "Ad Links" reserved for websites that have "bought" the particular position. Α site appearing at the top of SEO results attracts visitors for free, but takes a lot of effort, and there are no guarantees for the top. The cost of Search Engine Optimization that will take a website to the top positions depends on the existing competition regarding the particular key phrase. On the other hand, an advertising campaign, and the appearance of the site on the left column of results will bring Pay-Per-Click visitors. The results are immediate, and the cost is predictable, but with an ongoing expenditure. The right promotion strategy for your website may save you a lot of money. At netstudio we are successfully handling more than 50 AdWords and SEO campaigns for our customers. You are welcome to our consulting and website promotion expertise. Our SEO expert will propose what's best for your company's website, and prevent costly mistakes. At netstudio we use both of these website promotion methods, along with others, relevant to each case. Our expertise on these promotion strategies is crucial, either when we take on a website's promotion from scratch, or when we provide our consultation for ongoing advertising campaigns. We are certified Google AdWords Qualified Professionals. You have designed yourselves a running campaign? We can optimize it, and save you money. 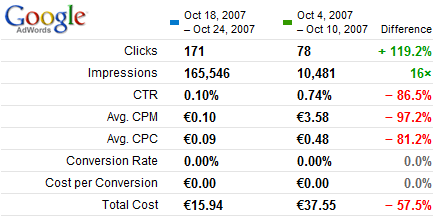 The chart above shows one of our customers' campaign, and the difference after netstudio took over, achieving an 81% drop in cost per click (CPC), and a 119% increase in visitors! Contact us to discuss your tailor-made website promotion.